WJSG Internet Radio: Eddie Van Halen to appear on new LL Cool J album? Eddie Van Halen to appear on new LL Cool J album? 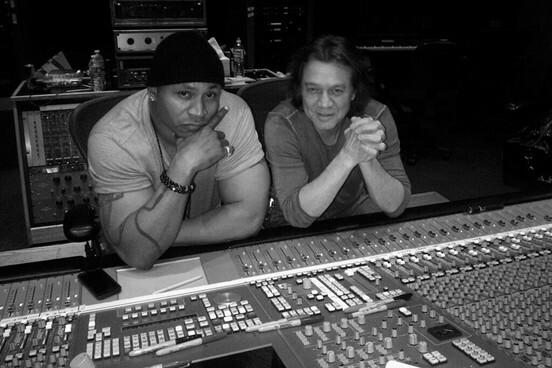 Eddie Van Halen is rumored to be appearing on the new studio album from LL Cool J. The guitarist sparked rumors he will appear on 'Authentic' when it is released in April after posting a picture of himself in the studio with the rapper on Twitter. Van Halen posted the image yesterday (March 14) with the simple message "Authentic 4.30.13." The album is also rumored to feature appearances from Joe, Monica, Jennifer Lopez, Kendrick Lamar, Tom Morello, Chuck D, Travis Barker of Blink-182 and Z-Trip. An album track-listing released in November 2012 revealed that Travis Barker, Z-Trip and Tom Morello will appear together on a track titled 'Whaddup'. It is not currently known which song Eddie Van Halen has contributed toward on 'Authentic'. The album is LL Cool J's first release since 'Exit 13' in 2008.